Leeson Motors with AEGIS Inside | Electro Static Technology, Inc.
LEESON® has a product line comprising thousands of AC and DC motors, gearmotors, and variable speed controls. 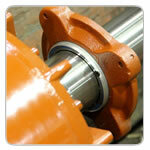 Many of their motors now include AEGIS® Shaft Grounding Rings. AEGIS Rings protect motors from electrical damage to their bearings, caused by variable frequency drive control. AEGIS Rings are available in the following motors. Click here for a mini-catalog of all LEESON motors with AEGIS. LEESON's lines of Premium Stainless Steel motors and Extreme Duck motors, through 2 HP, now include motors with AEGIS Rings installed inside. EXTREME DUCK ULTRA IS ONE TOUGH DUCK: A bronze winner in Plant Engineering’s Product of the Year, the revolutionary new design of this motor ensures that liquids won’t penetrate the motor in any mounting position, plus it’s easier to install and connect because of unique non-wicking colored leads. Less corrosion, less operating costs. This motor has an option to include an AEGIS Shaft Grounding Ring for ½ to 2 HP.